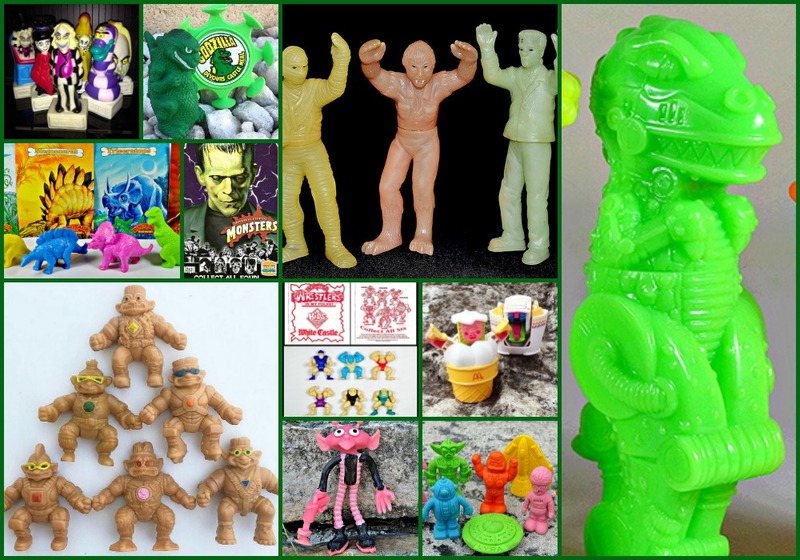 Little Weirdos: Mini figures and other monster toys: Little Weirdos' best fast food toys! Little Weirdos' best fast food toys! When you're a kid, the best part about going to a fast food restaurant is getting the toy in your kids meal. Sadly, most fast food toys are actually pretty boring. Only occasionally do really great examples surface, although cool kids meal giveaways were a bit more common in past decades, especially the 1980s and 1990s. In this post we'll take a look at some of the greatest, Little Weirdos-approved fast food toy offerings from over the years -- and by that I mean fast food toys that are mini figures, have a monster, alien, or robot theme, or generally look awesome! Disclaimer: there's been about a billion fast food toys released over the years, so I'm sure I missed some notable ones. Be sure to let me know your personal favorites in the comments. Universal Monsters have been featured as kids meal toys at least a couple times (read on for another time they made an appearance), but this set of 3 soft plastic, 4-inch tall, glow-in-the-dark baddies released at "the home of the Slider" (you might need to be an American Midwesterner to get that) were probably the first. It's an amazing set, even though Dracula is sorely missing. More on White Castle glow monsters here. One of life's greatest mysteries is why Troll dolls keep making comebacks, but there was a brief period in the early 1990s when they were particularly hot. 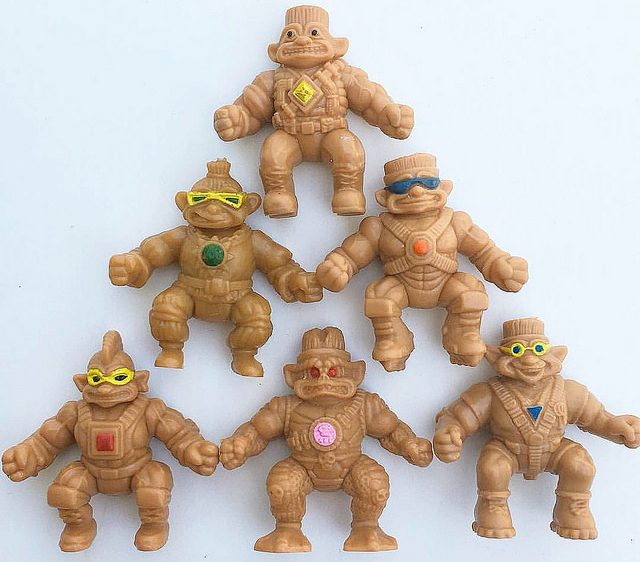 So hot that marketers thought it would be a good idea to try to market them to boys as well, which resulted in a cartoon and corresponding toys called "Stone Protectors," about Troll heroes and bad guys. In addition to action figures, a lesser-known mini figure set was offered through kids meals at Long John Silvers. They seem to have been inspired by MUSCLE figures, except with a few minor painted details, including a different stone color in each characters chest (a bad guy with a purple stone is missing in the photo above). I've never seen the cartoon, but I think it's safe to say these minis are probably the best thing to result from the creation of "Stone Protectors." More info on Stone Protectors minis here. Changeables (a.k.a "McRobots") are widely considered classics in the world of fast food toy collecting, and for good reason. 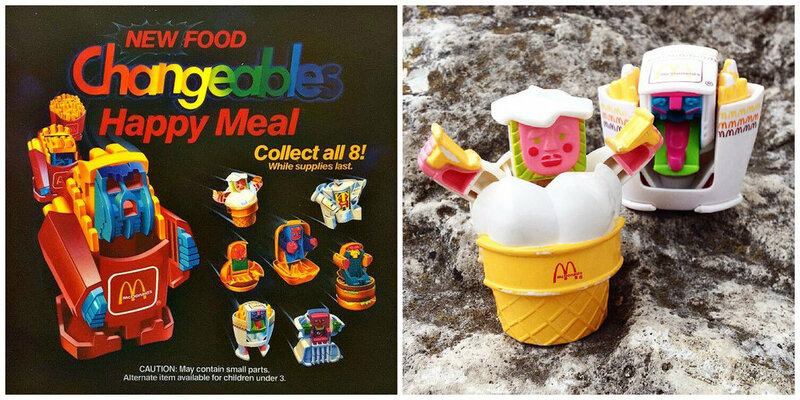 These robots, which transform into McDonald's food items, are very well designed and just a lot of fun. They were popular enough to result in a few different series, including a third and final one that consists of transforming dinosaurs instead of standard robots. For a closer look at all of the Changeables series, check out this very detailed post on Dinosaur Dracula. Wendy's hasn't had the greatest toys over the years, but they really did hit it out of the park with this set from 1993. Weird Writers are 5-to-6-inch tall figures of bizarre creatures that also double as markers (they come apart into 2 pieces to reveal the marker tips). These designs and sculpts are incredibly imaginative and well done. 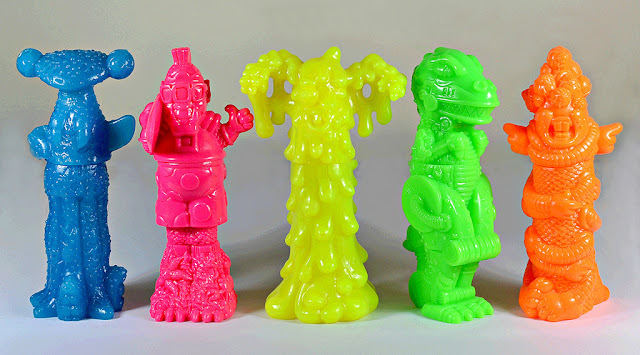 My favorite is the yellow goo-monster, which is just an all-around glorious chunk of plastic. More info on Weird Writers here. After the original, standard Monster in My Pocket releases died down, the only spinoff sets we got in the U.S. came in the form of promotional premiums (whereas several spinoff sets were sold widely in the U.K., including Wrestlers, Dinosaurs, Aliens and Super Creepies). One of the sets we did get on this side of the pond was Dinosaur in My Pocket from Hardee's restaurants. What's great about these -- and which differs from the MIMP dinosaurs released in the U.K. -- is that they're monochromatic and made of the same type of rubber as MIMP Series 1-4. Just all-around fantastic dino mini figures. More info on Dinosaur in My Pocket here. White Castle may have beaten them to the punch with their glow-in-the-dark Universal Monsters figures, but Burger King went all out in 1997 with these beauties. 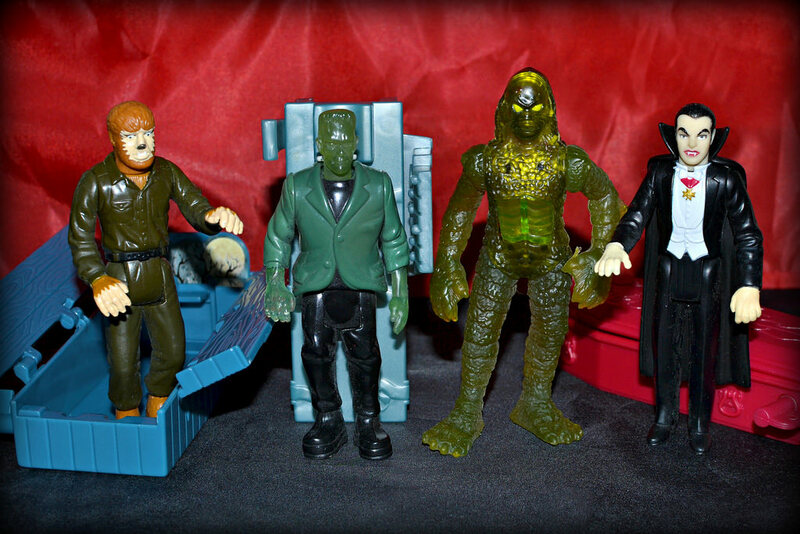 This set consists of 4 different monster action figures -- Frankenstein's Monster, Wolfman, Dracula and the Creature from the Black Lagoon -- complete with accessories and/or action features (like a light up feature for Frankenstein and a water squirting feature for the Creature). They are a bit reminiscent of Remco's classic Mini Monsters action figures. In addition to the coolness of the designs, they're just really impressive toys overall for something typically seen as a cheap giveaway item. For a smaller, localized fast food chain, White Castle came up with some winning toys. In 1990, they released this Godzilla set, consisting of an inflatable figure, some sort of suction wheel thing, a Frisbee thing, and a water-squirting figure. I only have 2 out of the 4, but really do love that little sinister-looking Godzilla squirter! 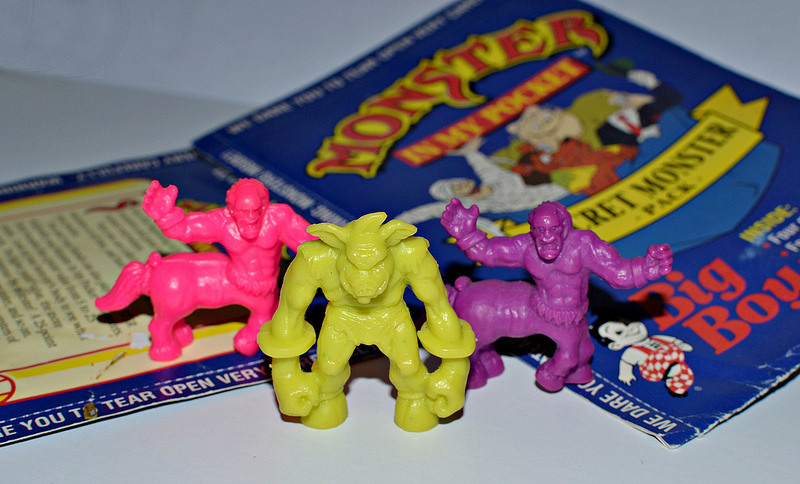 The third series of Monster in My Pocket was limited to a few different promotional releases, one of which was kids meal toys at Big Boy restaurants. The figures came in "Secret Monster Packs" along with stickers and games. While the same sculpts were released as cereal premiums in Canada, the Big Boy versions featured some color and material variations that make them highly collectable. More info on MIMP Series 3 here. 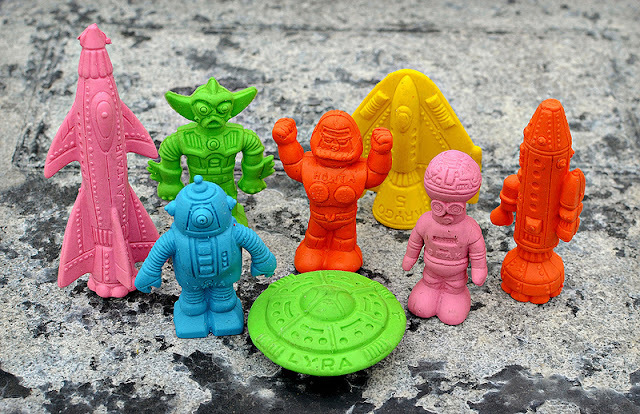 Diener Industries' Space Raiders erasers were available in many ways over many years, but they can be considered fast food toys because McDonald's gave them away in Happy Meals around 1979. It was clearly a simpler time when kids meal toys weren't expected to have features and gimmicks in order to capture kids' imaginations -- little rubber robots and spaceships did the trick. These weirdos are classics that will no doubt continue to have a fan base for as long as there are toy collectors. More info on Space Raiders here. I don't know a whole lot about these bendy alien figures other than that they were given out at Pizza Hut restaurants in the late-1970s and/or early '80s. 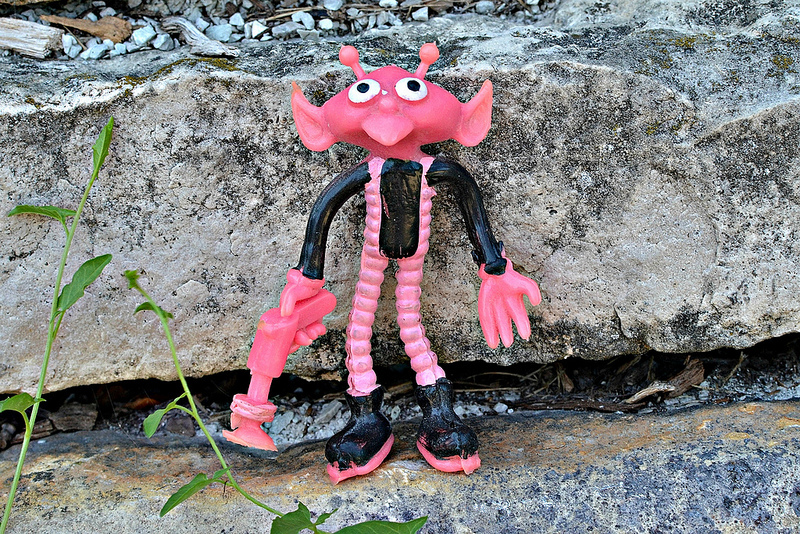 I only own one -- the pink guy pictured above -- and I'm not sure exactly how many different aliens were produced. I don't know about you, but I wish I could rewind to the days when you could go to Pizza Hut and come out with a colorful bendy alien. "Beetlejuice" is one of my favorite movies ever, so any Beetlejuice-related items automatically gets my interest. But these 2-sided figures, based on the cartoon and released at Burger King in 1990, are really cool in their own right. 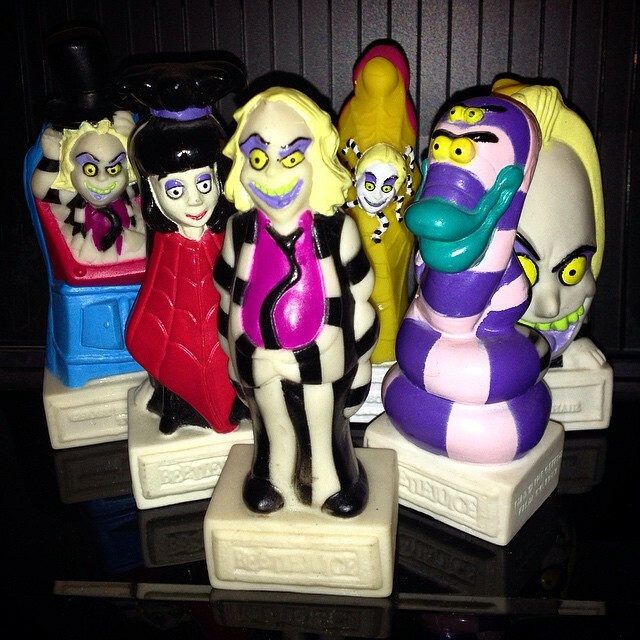 Each creatively-designed figure has 2 completely different things going on depending on which side you're looking at (for example, when you turn the figure of Lydia around, it becomes Beetlejuice standing on his head). You can see all sizes of each figure here. This is the third Monster in My Pocket-related set on the list, but so be it. We never got the standard store-released Monster Wrestlers in My Pocket here in the U.S., but we did get these fast food versions, thanks once again to White Castle. They are slightly different sculpts from the regular releases that were sold in U.K. stores, with fewer colors and details, which actually gives them a sort of bootleg-esque charm. 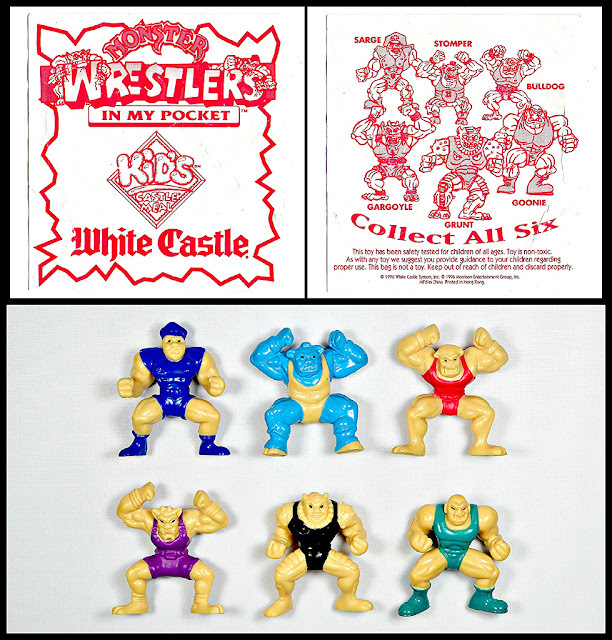 More info on White Castle MIMP Wrestlers here. Great post! They're possibly outside the LW scope, but I really dug those Wendy's Gobots when I was a kid...! Thanks - I didn't remember the Wendy's Gobots! Just looked them up. I'm not sure I've seen them. I'll have to do a search. I loved those little Beetlejuice figurines as a kid. I also dug the Changeables, and the McDonald's Charlie Brown figures that were farm related for whatever reason. I'm a big Mighty Max collector and just got the two Polly Pocket house toys you used to get from McDonalds in the early 90s. They were way more interesting than the Mighty Max ones: the interiors were really detailed and the figure inside would walk a Family Circus path along the house interiors.